It was during the rule of the North Borneo Chartered company that the railway in Sabah came into being. The engineer in charge of construction was Arthur J West and it was in his honour that the little town of Weston in the Brunei Bay was named after him. Weston was the start of the railway line which first ended in Beaufort town. Later it was extended to Tenom and the port in Jesselton (Kota Kinabalu). When it was completed in 1906, it was a very important means of transportation for the people and produce from the interior to the towns on the west coast of Sabah. 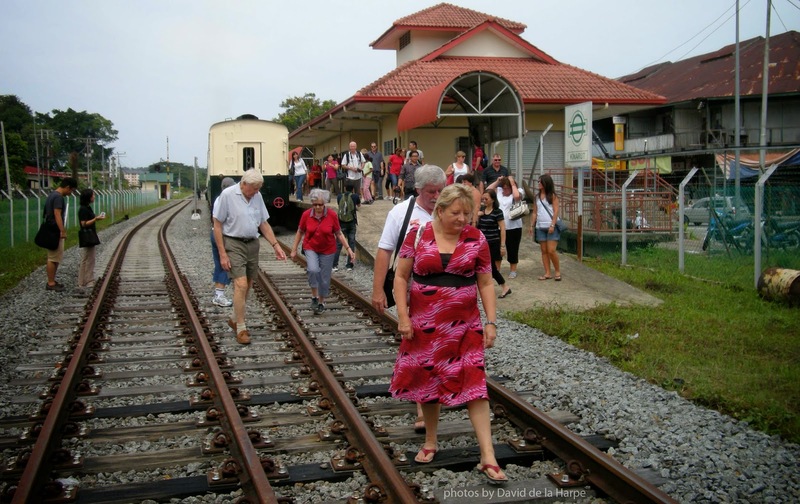 The railway suffered badly during the Japanese occupation of Sabah in WWII as many of the locomotives and parts of the line were destroyed mainly due to ailed bombing. After the war due to the lack of locomotives, the British converted many of the wartime jeeps into rail-jeeps that provided the much-needed passenger and goods service, while awaiting new locomotives. The steam locomotives were replaced by Diesel engines in the 1970s and a couple of the old steam locomotives are now on exhibit in the Sabah Museum grounds. 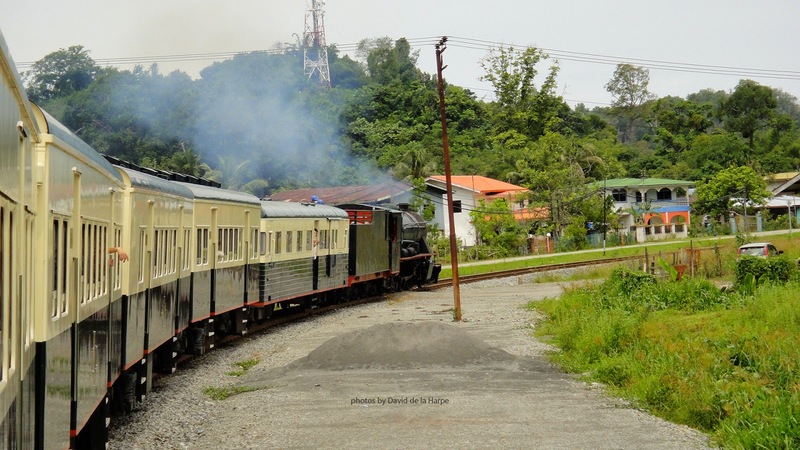 However in a joint venture project between the Sabah state railways and Sutera Harbour resort, one Vulcan 1955 steam locomotive was repaired and some of the old carriages tastefully refurbished. The carriages are a far cry from what they actually looked like at the turn of the century as they have been styled after the luxurious carriages of the Orient express. This special service is run only 2 times a week on Wednesdays and Saturdays and starts from The Tantung Aru station to Papar where it turns around and heads back. The whole tour last about 3 and a half hours. Upon arrival at the station, one collects your ticket and proceeds to the private platform where you will be given a passport. This is stamped with the various towns as you pass through them. You will be showed to your carriages by staff clad in colonial style uniforms complete with topis. It is usually free seating and the scenery is beautiful on either side. The journey starts with the blowing of the train whistle and you do feel like your travelling back in time as you look out the open windows and get whiffs of smoke from the wood fire in the engine room. The steam train is very popular with the locals and children living along the railway trek and they all rush to their doors and windows of their houses to wave at you as the train chugs past. The first part of the journey runs along the main Beaufort highway but soon you leave it and travel into the rice fields and rubber estates. A light breakfast of croissants with coffee & tea is served before the first stop at Kinarut. Passengers get off for a quick look around a colourful Taoist temple and then it’s back on the train where you’re served with some cold water and towels. The scenery gets more interesting as the train goes past stretches of beach and mangroves before reaching Papar town. At Papar, you have a longer stop, as this is where the steam engine head is turned around for the trip back to Tanjung Aru. Lwaving the train for the temple visit. The market at Paper is interesting with its offerings of colourful local fruits and vegetables and it has a good spice section where you can purchase cinnamon quills, pepper and curry powders. Once back on the train you will find that the tables have been set for lunch, which is served in metal Tiffin carriers. Lunch is a Malaysian affair with a variety of dishes from chicken satay, fried fish, biryani rice, cucumber & pineapple achar and local fruits served with coffee or tea. The sounds of the City traffic along the main highway will bring you back to reality and the present century as your train pulls into the Tanjung Aru station which signals the end of your journey.